April, 1863. Men and women, young and old, from all walks of life, gathered on the thoroughfare leading to the banks of the River Tigris in Baghdad to bid a tearful farewell to One Who had become their friend, their comforter and their guide. Mirza Husayn-‘Alí—known as Bahá’u’lláh—was being banished from their midst. As a prominent follower of the Báb, whose teachings had swept through Persia two decades before, Bahá’u’lláh had forfeited the privileged life into which He had been born, and instead embraced imprisonment and exile for the rest of His days. But despair would soon be transformed into hope: Before leaving the environs of Baghdad, Bahá’u’lláh would announce to His companions what many of them had already suspected—that He was the great Divine Educator heralded by the Báb, the initiator of a new era in history in which the tyrannies and injustices of the past would give way to a world of peace and justice: an embodiment of the principle of the oneness of humankind. The “Divine Springtime,” He would unequivocally proclaim, had arrived. Born in Tehran, Iran on 12 November, 1817, Mirza Husayn-‘Alí enjoyed all the advantages conferred by noble birth. From a very early age, He displayed extraordinary knowledge and wisdom. As a young man, rather than pursuing a career in government service as His father had done, Mirza Husayn-‘Alí chose to devote His energies to the care of the poor. He showed no interest in seeking position or prominence. With His acceptance of the religion of the Báb, life permanently changed for the young nobleman and His family. Although They never met in person, from the moment Mirza Husayn-‘Alí heard of the Báb’s message, He declared His wholehearted belief in it and put all of His energy and influence into promoting it. In 1848, a significant gathering of the Báb’s followers took place in a village in the northeast of Iran named Badasht. Mirza Husayn-‘Alí played a central role in the proceedings, which affirmed the independent character of the new religion. From this time onwards, Mirza Husayn-‘Alí was known as Bahá’u’lláh, meaning the “Glory of God” in Arabic. As the community of the Báb’s followers grew, so did the fierce opposition it provoked. Thousands upon thousands were subjected to the most cruel and barbaric treatment, and many were put to death. When three hundred Bábís sought refuge in a deserted shrine called Shaykh Tabarsi, Bahá’u’lláh set out to join them, but He was prevented from reaching His destination. In 1850, the Báb was publicly executed. With the majority of the Báb’s leading supporters killed, it soon became evident that Bahá’u’lláh was the only One to Whom the remaining Bábís could turn. The dungeon had once been the reservoir for a public bath. Within its walls, prisoners languished in the cold and unhealthy air, clamped together by an unbearably heavy chain that left its mark on Bahá’u’lláh’s body for the rest of His life. It was in this grim setting that the rarest and most cherished of events was once again played out: a mortal man, outwardly human in every respect, was chosen by God to bring to humanity a new message. After four months of intense suffering, Bahá’u’lláh—now ill and utterly exhausted—was released and exiled forever from His native Iran. He and his family were sent to Baghdad. There, the remaining followers of the Báb increasingly turned to Bahá’u’lláh for moral and spiritual guidance. The nobility of His character, the wisdom of His counsel, the kindness that He showered upon all and the increasing evidences of superhuman greatness in Him, revived the downtrodden community. Bahá’u’lláh’s emergence as the leader of the community of the Báb’s followers increasingly aroused the intense jealousy of Mirza Yahya, His ambitious, younger half-brother. Mirza Yahya made several shameless efforts to slander Bahá’u’lláh’s character and sow seeds of suspicion and doubt among His companions. To remove Himself from being the cause of tension, Bahá’u’lláh retired to the mountains of Kurdistan, where He remained for two years, reflecting on His divine purpose. This period of His life was reminiscent of Moses’ withdrawal to Mount Sinai, Christ’s days in the wilderness, and Muhammad’s retreat in the Arabian hills. Yet even in this remote region, Bahá’u’lláh’s fame spread. People heard that a man of extraordinary wisdom and eloquence was to be found there. When such stories reached Baghdad, the Bábís, guessing Bahá’u’lláh’s identity, dispatched a mission to implore Him to return. Residing once more in Baghdad, Bahá’u’lláh reinvigorated the Báb’s followers; the stature of the community grew and His reputation spread ever further. He composed three of His most renowned works at this time—the Hidden Words, the Seven Valleys and the Book of Certitude (Kitáb-i-Íqán). While Bahá’u’lláh’s writings alluded to His station, it was not yet the time for a public announcement. As Bahá’u’lláh’s fame spread, the envy and malice of some of the clergy was rekindled. Representations were made to the Shah of Iran to ask the Ottoman Sultan to remove Bahá’u’lláh further from the Iranian border. A second banishment was decreed. 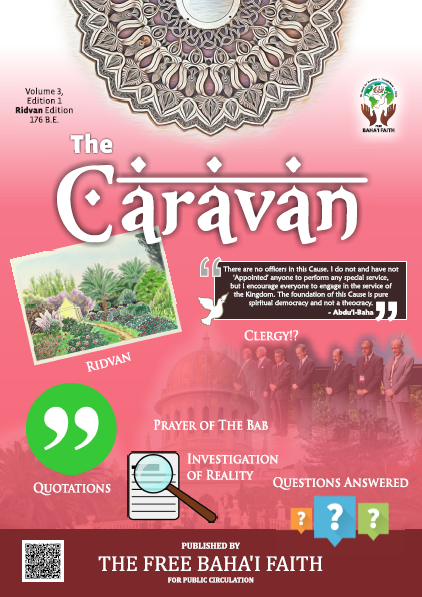 At the end of April 1863, shortly before leaving the environs of Baghdad for Istanbul (known as Constantinople in the English language of the time), Bahá’u’lláh and His companions resided for twelve days in a garden which He named Ridván, meaning “Paradise”. There, on the banks of the River Tigris, Bahá’u’lláh declared Himself to be the One heralded by the Báb—God’s Messenger to the age of humanity’s collective maturity, foretold in all the world’s scriptures. Three months after departing Baghdad, Bahá’u’lláh and His fellow exiles reached Constantinople. They remained there for just four months before a further banishment took them to Edirne (Adrianople), a gruelling journey undertaken during the coldest of winters. In Adrianople, their accommodation failed to protect them from the bitter temperatures. Bahá’u’lláh referred to Adrianople as the “remote prison.” Yet despite the inhospitable conditions under which the exiles were forced to live, inspired verses continued to flow from Bahá’u’lláh’s pen, and His message reached as far away as Egypt and India. During this period Mirza Yahya, the jealous half-brother of Bahá’u’lláh, contrived to poison Him. This tragic episode left Bahá’u’lláh with a tremor that showed in His handwriting to the end of His life. Beginning in September 1867, Bahá’u’lláh wrote a series of letters to the leaders and rulers of various nations. In these prescient writings, He openly proclaimed His station, speaking of the dawn of a new age. But first, He warned, there would be catastrophic upheavals in the world’s political and social order. He summoned the world’s leaders to uphold justice and called upon them to convene an assembly where they would meet and put an end to war. Only by acting collectively, He said, could a lasting peace be established. His warnings fell upon deaf ears. Continued agitation from Bahá’u’lláh’s detractors caused the Ottoman government to banish Him one final time, to its most notorious penal colony. Arriving in the Mediterranean prison city of ‘Akká on 31 August 1868, Bahá’u’lláh was to spend the rest of His life in the fortified city and its environs. Confined to a prison for more than two years, He and His companions were later moved to a cramped house within the city’s walls. Little by little, the moral character of the Bahá’ís—particularly Bahá’u’lláh’s eldest son, ‘Abdu’l-Bahá—softened the hearts of their jailers, and penetrated the bigotry and indifference of ‘Akká’s residents. As in Baghdad and Adrianople, the nobility of Bahá’u’lláh’s character gradually won the admiration of the community at large, including some of its leaders. In ‘Akká, Bahá’u’lláh revealed His most important work, the Kitáb-i-Aqdas (the Most Holy Book), in which He outlined the essential laws and principles of His Faith, and established the foundations for a global administrative order. In the late 1870s, Bahá’u’lláh—while still a prisoner—was granted some freedom to move outside of the city’s walls, allowing His followers to meet with Him in relative peace. In April 1890, Professor Edward Granville Browne of Cambridge University met Bahá’u’lláh at the mansion near ‘Akká where He had taken up residence. Bahá’u’lláh passed away on 29 May, 1892. In His will, He designated ‘Abdu’l-Bahá as His successor and Head of the Bahá’í Faith — the first time in history that the Founder of a world religion had named his successor in a written irrefutable text. This choice of a successor is a central provision of what is known as the “Covenant of Bahá’u’lláh,” enabling the Bahá’í community to remain united for all time.